Define scheduling in engagement programs. Define pauses in engagement programs. Explain how time affects engagement program logic. Each engagement program step type (trigger, action, or rule) has configurable time settings. These settings let you control how long a prospect waits on a step before moving on. In this unit, we take a closer look at how you can control time for prospects inside an engagement program, as well as how you can schedule your engagement programs to fit your marketing calendar. You can schedule your engagement program to start on a specific date. Once you’ve created your program and are ready to begin, click the Start button. This brings up the following dialog box. As you can see, you can start your program immediately or on a scheduled date and time. You can also tell Pardot to continue your program indefinitely or to stop your program on a scheduled date and time. 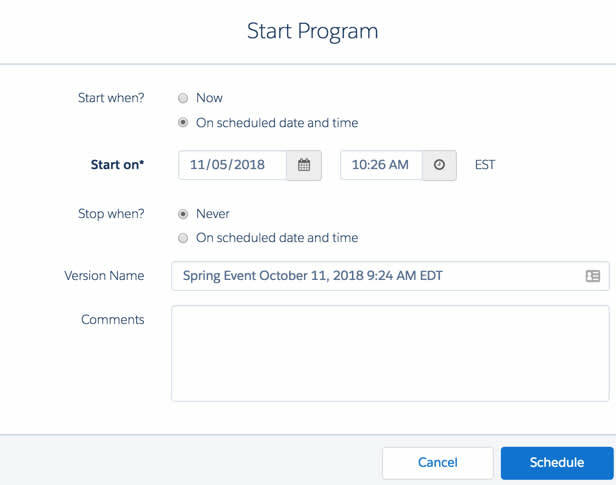 In addition to scheduling a start date and time for your entire program, you can also schedule a start date for individual emails inside your program. To do this, select the Action step, choose Send Email, and then enter your send date. When prospects reach this step, Pardot holds them here until your chosen email date. 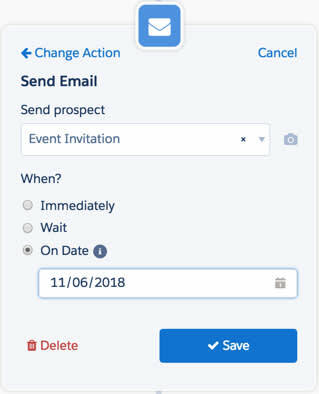 On the scheduled email date, Pardot sends prospects the email and then moves them along again, through the program’s defined paths. When scheduling emails, you cannot specify a time. 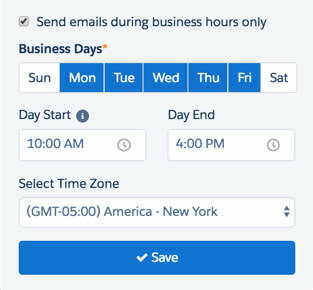 If you use the Send only during business hours feature, then Pardot will send your email at when the "Day Start" time you’ve set on that date resumes. If you do not use that feature, then Pardot will send your email just after midnight on the morning of your scheduled send. Engagement Studio also lets you set business hours for your organization. Business hours are programwide and restrict when your engagement program sends emails. 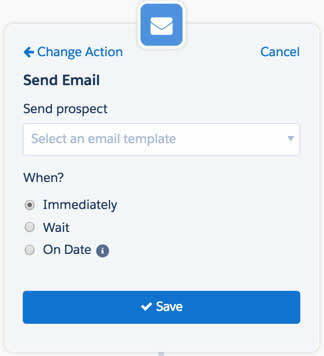 If a prospect reaches an email send step outside of business hours, Pardot waits to send the email until the prospect is within business hours. We recommend that you turn this optional setting on. It puts your content in front of your prospects when they’re in the office to read and engage with it! You set your custom business hours when you create your engagement program. You can also control timing through wait periods. Wait periods let you hold prospects on a step until a specified time has elapsed or a specific action occurs within a period. The way a wait period functions in a program depends on whether the step is a trigger, action, or rule type. Let’s take a closer look at what that means for timing inside each engagement program step. Immediately: Engagement Studio applies the specified action once the prospect hits that step. Wait: Engagement Studio applies the action once the specified pause time has elapsed. Immediately: Engagement Studio evaluates the specified rule criteria once the prospect hits that step. Wait: Engagement Studio evaluates the rule criteria once the specified pause time has elapsed. Wait: Engagement Studio executes the trigger once the specified pause time has elapsed. Up to a maximum of: Engagement Studio moves prospects down the “yes” path as soon as they take the action within the specified time frame. If prospects do not take the action, Engagement Studio takes them down the “no” path once the specified time frame ends. Now let’s see what these options look like inside an engagement program. This trigger listens for a Custom Redirect click. 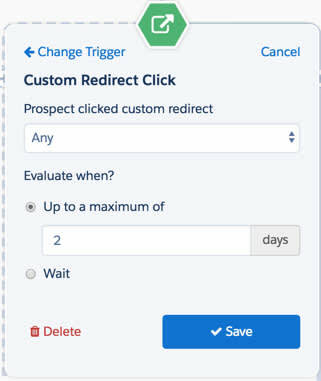 The time is set to a maximum of 2 days, so the program listens for a prospect to click the custom redirect for 2 days after they reach the trigger. If the prospect clicks the custom redirect link within that time frame, they proceed down the “yes” path. 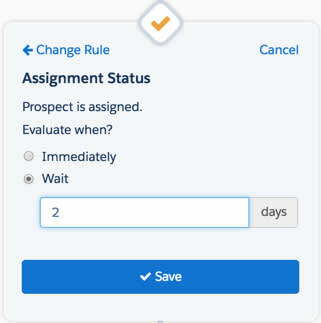 This rule evaluates a prospect’s assignment status over the wait step of 2 days. Pardot holds prospects here for 2 days, and then checks to see if they’re assigned or not. This action is sends an email on a specific date. In this example, all prospects who reach this step before 11/06/2018 will receive an email on 11/06/2018. All prospects who reach this step after 11/06/2018 will skip this step. When you pause an engagement program, you keep prospects in the same place. For example, if you pause a program while a prospect is on step A, the prospect remains on step A until you restart the program. The same is true for wait periods. If you pause a program when a prospect is on day 3 of a step with a wait of 5 days defined, the prospect will still be on day 3 of 5 when you restart it, as if no time has elapsed. Again, remember to use the Test function to check program timing before you start your program. Testing gives you an estimate of the time it will take a prospect to flow through your engagement program based on their actions and decisions. What Happens When a Waiting Prospect Is Suppressed or Removed from a List? How Do Waits Work When I Pause an Engagement Program? How Do Waits Work with Only Send During Business Hours Enabled?